Aluminium frames with stretched panel. Fabric wallframes. With stretched panel. Choose your model. This frame range can be placed at the wall or ceiling. Structures for outlets, commercial or corporate decoration, as well can be used for stands’ assembly or as a complement at events. Wall Frame is the division of frames of the Lineartex range that can hanged on to the wall or hang from the ceiling. All frames in this range are reusable because of the textile graphics system. This stretched fabric system allows changing the image quickly and easily. Is it easy to assemble the aluminum frames? Yes, these frames always include an assembly kit with instruction manual. It is also possible to send it assembled. This option is just recommended for small or medium size frames. Is it possible to illumine the frames? Yes, the aluminum structures Stand Up Frame allow to place spotlights to lighten the graphs. The frames with stretched fabric also admit to place accessories such as shelves, screens, etc. Each project is customizable and requires a previous study to evaluate the kind of material that we will use. Range of structures with aluminum base and stretched panel for freestanding installation through brackets. Are the stand-up displays shipped assembled? We usually send the Photocalls and all the big products frames disassembled and even in spare-parts, to save on transport and storage. Our aluminum profile systems are very easy to assemble and include instructions to simplify the procedure. We always include an assembly kit with the necessary accessories and instructions. Moreover, our customer service department is at your disposal for any questions that may arise. Why Choose Stretch Fabric Display? Unlike other exposition systems, stretch fabric displays offer a perfect and high-quality finish. The fabric can be interchanged and reused as it can be washed and stored without any alterations. We have different kind of fabric according to each need. 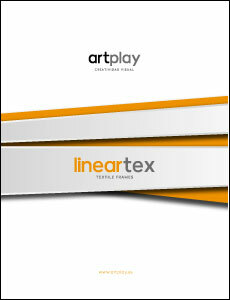 We invite you to see the section Printtex for more information. The fabric is ideal for covering large walls and for the creation of stands and events due to its high print quality that offers very intense colors providing sophisticated and welcoming environments. Which textiles are the most suitable for these structures? For stand up structures that will be placed on walls or in front of them, the most appropriate type of textile is the Banner, because it’s light and also for its price. For stands, or exhibitions made with self-portable displays, the ideal is the blackout as it is completely opaque and do not let light through it. The fabrics can be washed separately and always in cold water. Unwise to use dryers and dry-cleaning machines. Do you want our catalogue in PDF?